Advanced Options Menu in Windows 10. Depending on the version of Windows you're using, there are several different ways to automatically repair major Windows operating system problems without resorting to a destructive process, like a Reset Your PC or a Windows Clean Install. The newest versions of Windows have really easy, automated ways of repairing problems that you might have tried to fix manually but were unsuccessful at, like random error messages, overall slowness, or even problems that prevent Windows from starting at all. It's a mixed bag with older versions of Windows, with some automatic repairs for certain types of issues or all-or-nothing repair processes that, while sometimes might seem like overkill, are certainly welcome when you need them. See What Version of Windows Do I Have? first if you're not sure which of the versions of Windows listed below is installed on your computer. Please don't use what you read below as the only troubleshooting for your problem. Sometimes the ideas below are the best bet, but other times there are much more simple and effective solutions. So, if you haven't already, search through Lifewire for the specific error message or behavior that you're seeing - we might have much more specific advice to give. Windows 10 and Windows 8 have the greatest number of automatic repair options, which is no surprise considering they're the newest versions of the Microsoft Windows family. A Startup Repair (formerly called Automatic Repair) is your best bet if Windows 10 or Windows 8 isn't starting correctly. Startup Repair is available from the Advanced Startup Options menu. See How to Access Advanced Startup Options for instructions on accessing that menu. If a Startup Repair didn't do the trick, or the problem you're trying to fix isn't related to Windows starting properly, then Reset This PC is your next best bet. 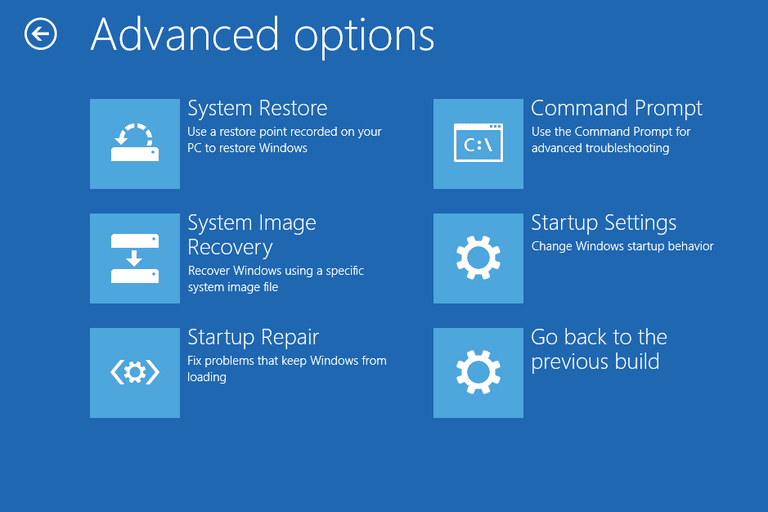 See How to Reset Your PC in Windows 10 & 8 for a step-by-step walkthrough of this process. The Reset This PC process in Windows 10, called Reset Your PC or Refresh Your PC in Windows 8, is like a "copy over" of Windows. If you're familiar with Windows XP, it's very similar to the Repair Install process in that operating system. You have the option of saving your personal data with Reset This PC or have it removed, too. Unfortunately, there is nothing like Reset This PC (Windows 10 & 8) or a Repair Install (Windows XP) that works to overwrite all important files, processes that tend to be very helpful when you have particularly stubborn problems in Windows but don't want to lose your important data. See How to Repair Install Windows XP for a complete walkthrough. While the Repair Install process in Windows XP is not designed to remove any files, I recommend that you play it safe by backing up your important files, which you can automate with an online backup service or an offline backup program (or do it manually by just copying the files). You should also prepare to reinstall your programs just in case the Repair Install damages any of their installations. If you're using a restore disc from your computer manufacturer instead of original Windows media or a system repair or recovery disc/drive, the automatic repair processes as described in the linked tutorials above may not be possible. In your case, please reference the documentation that came with your computer or contact your computer manufacturer directly for directions.